Above: food served at my program at Felicity House, representing desserts beloved by the three queens: gingerbread, Victoria sponge cake with cream, and chocolate biscuit cake. In a bit of a divergence from the food of the ancient world, I was recently invited to give a presentation at Felicity House, a community center in Manhattan, on historical food. Specifically, what kind of food does a queen of England eat? I chose to focus on Elizabeth I, Victoria, and Elizabeth II, the three longest-reigning and most famous of England’s eight queens regnant (AKA women who rule in their own name, as opposed to a queen consort, the wife of a ruling king). Each of these ladies exemplifies a unique period of English history, and by looking at the royal diet, we can learn a lot about the place of food in her society and the changes it underwent over time. Above: a young Elizabeth I in her coronation robes, in a ca. 1600 painting by an unknown artist, copied from a lost 1559 original. Source: Wikimedia Commons. “The Virgin Queen” led an athletic, active lifestyle and preferred to dine alone except for special occasions. Eating does not appear to have been a major driving force in her life. However, the queen did pay close attention to food as an industry and its effect on her economy. Out of the 382 royal proclamations made during Elizabeth’s 45-year reign, 200 were food-related. She set and reset prices on specific goods, prohibited imports from plague-stricken areas and England’s economic rivals, and ordered her subjects to eat fish at least twice a week to support the English fishing industry. England in Elizabeth’s time was beginning to grow its global empire, and costly ingredients like spices from Asia and sugar from North Africa began to appear more frequently on the tables of the wealthy. We know Elizabeth was no exception. When the queen was 65, a German visitor, Paul Hentzner, wrote that “her teeth [are] black, a fault the English seem to suffer from because of their great use of sugar.” He meant the English upper classes, since sugar was still out of reach for many of Elizabeth’s subjects. Most people in Elizabethan England subsisted on a simpler diet of vegetables, bread, and small game like rabbit, since hunting large game in “the king’s wood” was the exclusive right of the monarch. 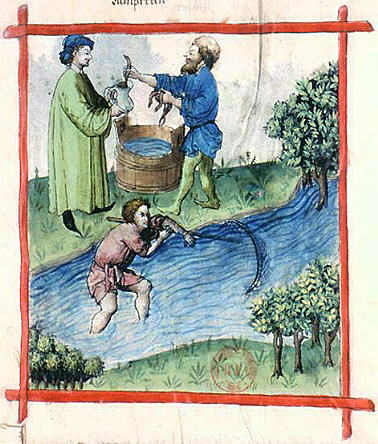 Even among the elite, food was regulated by strict hierarchy. At an Elizabethan royal banquet, everything was determined by status, from seating to tableware to which “mess” (shared plate) a guest ate from. If you weren’t a top-tier guest, you didn’t even get dessert. After dinner, the monarch and other VIPs would move to another room for a sweet course called the void, because it was served once everyone had voided (exited) the main dining hall. There, guests would stand rather than sit as they sipped hippocras (mulled wine) and nibbled sweet delicacies like marchpane (marzipan), suckets (candied fruit), crispy wafer cookies and gingerbread. In fact, the earliest-known gingerbread men were served at one of Elizabeth I’s state dinners, when she had the confection shaped to resemble her guests of honor. This was an example of “subtlety,” a tradition of elaborate edible entertainment that had been a hallmark of European fine dining since Roman times. But Elizabethan gingerbread was not much like our modern cookies. Instead, it was a paste of powdered ginger and breadcrumbs bound together with honey. Above: Victoria (center) with her son, the future King Edward VII, and family. 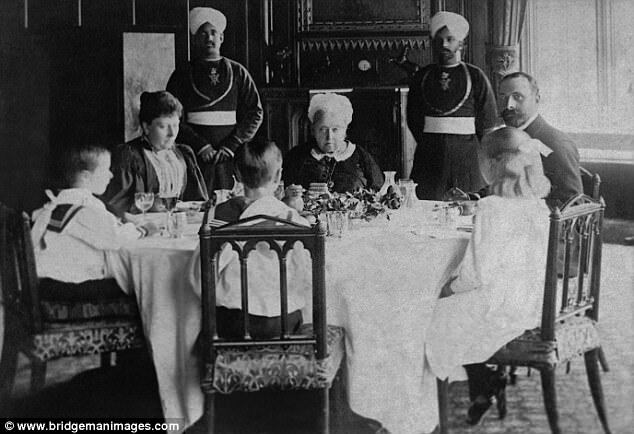 Victoria employed many Indian servants in her household toward the end of her life, such as the two men pictured here. Source: Bridgeman Images. At dinner Victoria was famously fast, speaking few words and plowing through six to ten courses in as little as half an hour. Servers moved the meal along at the pace of the monarch, sometimes to the dismay of other diners. Lady-in-waiting Marie Mallet wrote dejectedly that when dining with Victoria, “the service was so rapid that a slow eater such as myself never had time to finish even a moderate helping. Pecking like a bird I could usually satisfy my hunger, but could not enjoy it.” The Duke of Devonshire once caused a scandal by shouting “Here, bring that back!” to a footman who had lifted his plate of lamb chops, since the queen had finished her food before the Duke had even started his (other guests were aghast, but the queen herself was reportedly amused). Matching the meal to the monarch was just one example of the strict rules of etiquette that governed 19th-century dining, rules which had become increasingly divided along gender lines since Elizabeth I’s time. After dinner, Victorian ladies would “go through” to the drawing-room to play cards and sip tea, while the men remained at the table for brandy, cigars, and conversation considered inappropriate for ladies’ ears (such as politics). Victoria herself was reportedly much more animated and relaxed among women than when dining in mixed company. As England’s colonial empire spread, new culinary influences made their way to British tables. In 1853, the cookbook Modern Domestic Cookery reported that “curry, which was formerly a dish almost exclusively for the table of those who had made a long residence in India, is now so completely naturalized that few dinners are thought complete unless one is on the table.” Victoria is credited with helping to popularize curry and Indian cuisine in general in Britain, through the influence of her attendant and friend Abdul Karim and other Indian staff. But as with Elizabethan gingerbread, the Anglo-Indian curries of the 19th century were quite different from modern versions: they were made with little to no chili pepper and might include cooked cucumber or apple. Check out a reenactment of a Victorian-style curry recipe above. Above: a rare photo of Elizabeth II mid-meal. Source: Getty Images. In total contrast to her great-great grandmother Victoria, the present monarch of England has been described by her former personal chef as someone who “eats to live.” Like the earlier Queen Elizabeth, the present one is not much of a foodie. According to one story, when a staff member suggested upgrading the Victorian-era equipment in the palace kitchens, the queen replied that the money would be better spent on new saddles for her horses. Even some of the recipes presently used by palace chefs have remained unchanged since Victoria’s time, such as a rich chocolate cake served on royal family birthdays. Though old traditions remain firmly in place for official palace functions, rules of etiquette are becoming increasingly relaxed, especially among the royal family’s younger generations, who are known to keep a much smaller staff than in previous centuries, and even to cook for themselves. Elizabeth II’s good health and longevity are likely due in no small part to her balanced and regimented diet. The queen eats seasonally in small portions, with plenty of fresh fruits and vegetables and light, healthy proteins like grilled chicken or sole. She avoids onions and garlic entirely (a queen must have fresh breath) and doesn’t eat carbs if dining alone. But just like her predecessor queens, she’s willing to indulge when it comes to sweets. Some of Elizabeth II’s favorites include jam-pennies (tiny round sandwiches of jelly on white bread, served at teatime) and a rich chocolate biscuit cake with cookies baked inside it, recently served at the wedding of her grandson Prince Harry. Elizabeth loves this particular cake so much that she brings any leftovers with her when traveling, though she will only eat it gradually, a sliver at a time. Tea, which was firmly established in Britain during Victoria’s reign, is a well-loved tradition for Elizabeth II. 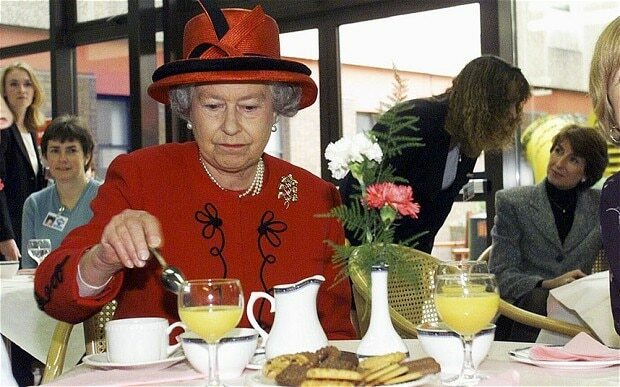 The queen starts her day with a personalized Earl Grey blend made by Twinings, and likes to have a full assortment of sandwiches and pastries available for afternoon tea. One popular tea sandwich was actually invented for her: coronation chicken, a cold chicken salad made with raisins and curry powder, first served at the queen’s coronation luncheon in 1953. On her frequent travels to Commonwealth countries and beyond, Elizabeth II is gracious enough to sample whatever local delicacy is offered her without fuss, including sea cucumber in China. This is only befitting her role as a modern monarch, less a divinely appointed ruler and more a cultural ambassador to the world (she is the world’s most-traveled head of state). Regardless of her individual appetites, as society and the position of the monarchy changes, the food of England’s queen continues to be emblematic of her reign. Our rendition of Elizabeth II’s beloved chocolate biscuit cake.